Iphone was launched on June 29th 6:00pm (EDT) in U.S. We heard people waiting inline for that awesome Hi-End technological cellular device the whole night!!. There are two models of Iphone, the 4 gigbyte model which costs $499(approx Rs.24,950) and an 8 gigbyte model $599(approx Rs.29,950) ontop of this you need pay $59(approx Rs.2950) for At&T Service plan. 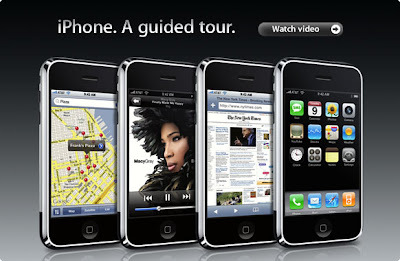 Folks in India have to wait till 2008 to get hands dirty on the new IPHONE. Snapshots of people waiting outside apple store to get iphone. Apple's new feature in LEOPARD known as TIME MACHINE. You can go back in time in that specific file,folder,application.......... in an amazing 3d graphics look. click on those links for more information. Two months back I was in IIIT-B to attend a Techfest known as "Innofest". it was really exciting participating in all the events although I didnt win any prize. Well the best part was I saw a banner "Computer Kitchen"(sponsor) and saw their web link and noted down. I walked into the institute, I saw their(computer kitchen) small mall, I saw few gadgets like mp3 watch, mp3 sun glasses, usb light, usb coffee cup heater, Usb pen ............it goes on and on , I saw a lot of cool products which can be used with your computer or a laptop!! I bought a USB light which I use with my laptop bcos at night it acts as source of light to see the keyboard/touchpad and it has helped me a lot! I tried out a few gadgets there it self like that mp3 sunglasses, I listened to few songs , its really amazing! Its no more in movies that you see all those crazy gadgets its here check out "COMPUTER KITCHEN"
"Look Above there is a lot going on"
I met him 2 years ago in IISC(Indian Institute of Science) bangalore. That one hour lecture on Space was thrillig experience for me in my life. 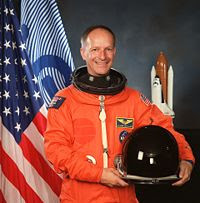 He has spent 1000 hours in space, he has repaired Hubble space telescope! done a few space walks, He shared a lot of personal experiences with us which was enchanting moments of our lives! I wish i had a handycam or a simple camera at that time! He was talking about weightlessness and how astronauts tackle it....."We used to drink floating watter bubbles...... and had more fun". At the end of his talk he told all of us "Look above there is a lot going on". I went to him inperson and asked him about UFO's it may sound like fiction now, but at that time i was totally into UFO's and used to read a lot of science fiction novels! He said " No I havent Seen one" and smiled! i asked his autograph , he asked my name, he didnt understand my accent So he wrote "SRIKANET" instead of SRIKANTH. That was one of the cheering moments of my life! Startups!! Get help from the BIG GIANT!!! Starting your own small business can open the door to independence, fulfillment, and prosperity, but figuring out the first steps can be intimidating. But don’t be discouraged. Microsoft now offers a free online resource for new business owners: Microsoft Startup Center. Visit http://www.microsoft.com/smallbusiness for clear steps on how to get your business going. Explanations are simple and straightforward, and you'll find links to the places you need to go to get things done. In addition to information you will get a practical guidance from Microsoft. A internet browser and it runs on windows platform! Safari is the fastest web browser on any platform. Safari’s clean look lets you focus on the web — not your browser. Organize your bookmarks just like you organize music in iTunes. Say goodbye to annoying pop-up ads and pop-under windows. Search any text on any website with the integrated Find banner. Open and switch between multiple web pages in a single window. Instantly snap back to search results or the top level of a website. Let Safari complete online forms for you, automatically and securely. RSS tells you when new content is added to your favorite sites. Resize text fields on any website: Just grab the corner and drag. Keep your online activities private with a single click. Apple engineers designed Safari to be secure from day one. A good way to find Wifi Hotspots at your place! Communication Sector is going to have a great impact through Wireless Technologies coming up nowadays. Everyone has a Wifi hub at home using a Wifi router and wants to enjoy the power of being wireless, move anywhere with internet! . In Bangalore,India approx 233 Wifi Hotspots are found, So if you want to goto a place and planning to browse internet, well dont worry Jiwire provides a unique search for finding Wifi hot spots at your location. Visit http://www.jiwire.com/search-hotspot-locations.htm . Wanna look at celestial bodies! Better aim at them!!!! If you go out at night and watch the horizon, your mind is veiled with thoughts and mysteries about the stars, galaxies, universe, Well dont supress that thought and get depressed, there is a better way to explore the universe. 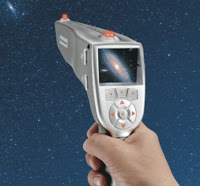 MEADE Instruments have developed unique product wherein you just have to point the star or any celestial object you want to look at and just shoot!!! yes exactly point and shoot. Just aim the gun shaped handset at the celestial body of your choice and pull the trigger. Using GPS and accelerometers to determine what you are looking at, the mySpy(product name) pulls the information out of a 30,000 object database (upgradeable via SD card). The mySky then delivers video, audio descriptions and "Fun Facts". There is a guided tour mode, pointing you at galaxies and stars of interest. This is obviously going to be best for kids, but I can see some use in it for regular astronomers, if just for identification. You can find more information here Meade. Video Editing isnt a easy job for an amature, who doesnt know much about the video editing softwares available on the WEB. This sunday I was trying to convert all my mini dv tapes into dvd's , At first I need to find a way to connect it to PC and then stream/capture it on to my hard disk and then get a software for editing the video, then burn it onto a dvd in DVD format i.e(*.vob). I started of with connecting the sony handycam(hc36e) to my pc through USB, and i started a software given by the manufacturer and i clicked on capture, it started capturing..... I wanted check if it had captured the video correctly or not so i stopped it and played thecaptured video, Ghosh!!! I had a serious problem with audio to video synchronization. The problem was with the speed, mean the usb! so i used a IEEE 1394 fireward card and captured the video using Ulead video studio v8.0 pro, You folks can try out in torrents or rapidshare to download the softwares!, and one more important thing "the video captured will be in DV format(raw video) so you need to have sufficient amount of diskspace(if you are capturing 1 hr video then you need to have approx 15gb hdd space)". So people dont use usb, use firewire card its really good to convert them onto dvd's. Then I used windows movie maker(updated==latest) and created clips, I created titles and subtitles with animation and saved it as WMV with the same size and fps(frames per second). Well your dvd player recognizes *.vob files not *.wmv files so I used a video converter known as Yash Video converter v3.2 (search in torrents) and converted my *.wmv file to *.vob. Woah! I played it on my DVD player and its just awesome! No loss of clarity,quality,quantity. It is same as the cassette tape! with animated titles, subtitles and images.... Well you can also use Pinnacle Studio mp20, or MV45(monarch vision) for capturing,editing and creating dvd's! My sincere advice, please dont use USB! USE firewire card instead, for capturing, it is going help a lot!